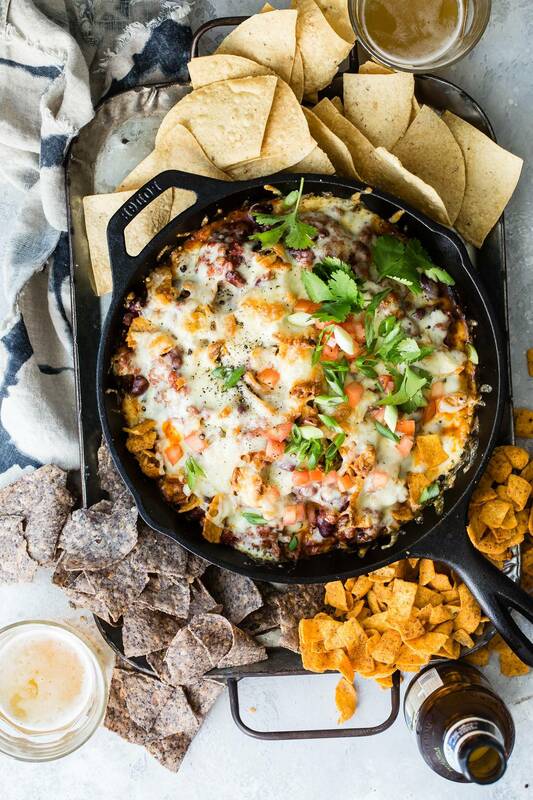 Game day never looked so good with a giant bowl of this chili cheese dip! We all talk about game day and how important the snack food choices are, and I totally agree with all of that! But Let’s not just focus on a small time of the year where we can hungrily grab scoops of spicy hot chili with two kinds of melted cheese and crumbled Frito chips! This dip would be welcome any time of the year, even in the hot summer paired with an ice cold beer! Heck, I’d even crush this dip as an appetizer before my turkey and stuffing at Thanksgiving. It’s that good, and don’t be swayed by having to make the chili from scratch. 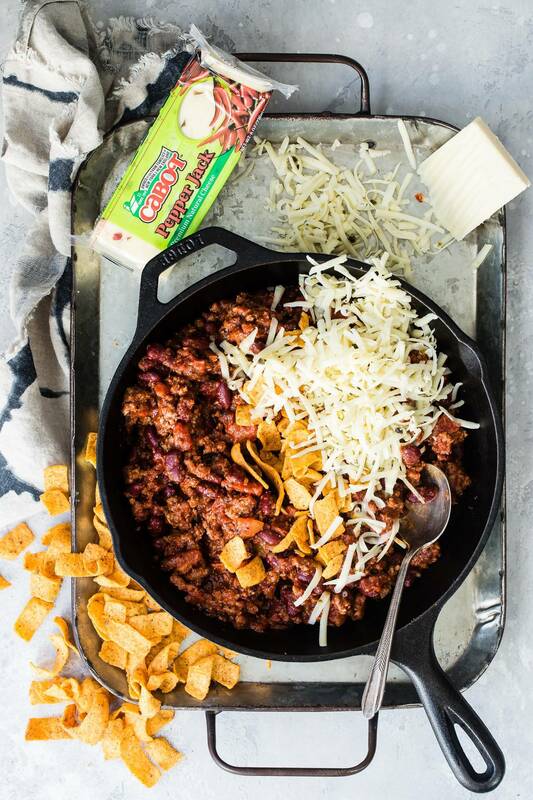 It’s quick and easy, the hardest part is waiting for the blanket of cheese to start bubbling and watching the juices from the chili creep up around the sides of the pan. I think you know exactly what I’m talking about! What kind of cheese should I use for my chili cheese dip? 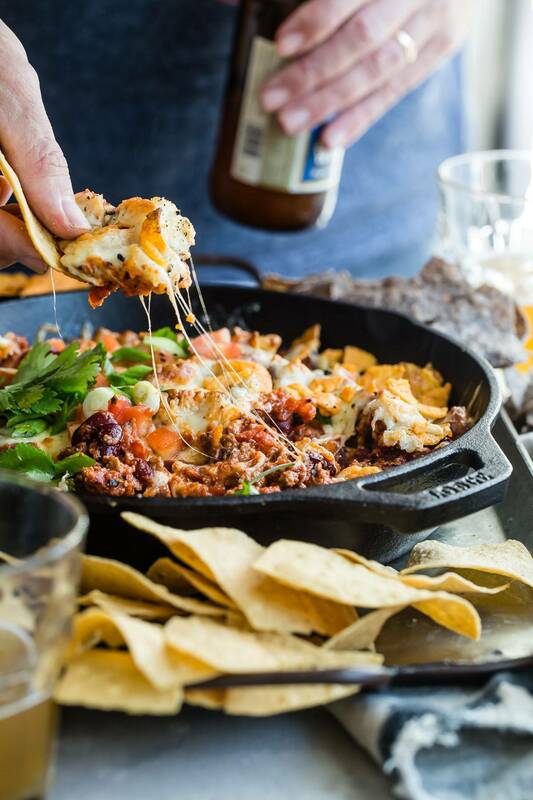 With a chili cheese dip like this, you need to make sure the cheese you use is going to add tons of flavor and melt easily enough. I used about 90% Cabot Pepper Jack and a small amount of Cabot Vermont Sharp Cheddar. The spicy pepper jack kicked up the heat just a little while the sharp cheddar kept things creamy enough to get a good cheese pull! What makes Cabot Cheese so unique! This year Cabot is celebrating their 100th year as a co-operative. That’s quite an achievement but doesn’t surprise me with the choice of naturally aged cheddars they have. Cabot is owned by 1000 farming families throughout New England and New York. Cabot co-op can also boast that 100% of profits go right back to the farmers so they can continue to make cheese for crazy delicious dips like this one! 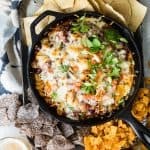 What can I serve my chili cheese dip with? 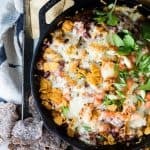 Make sure you have enough tortilla chips on hand when you set this chili cheese dip down because it’s not going to last long. 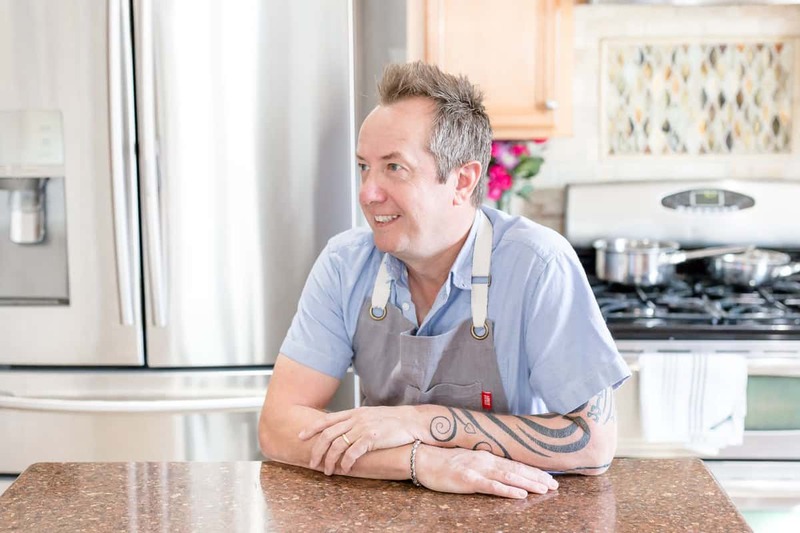 You can also use more of the Frito chips for dipping or slice a baguette into thin strips and toast them in the oven like you would do to make a crouton. If all else fails, a spoon and a bowl will keep your game day friends happy! I recommend doubling up on this recipe! This post was sponsored by Cabot Cheese! Check out this handy store locator to see where you can find Cabot Cheese! This dip is loaded with rich chili and topped with melted pepper jack cheese! 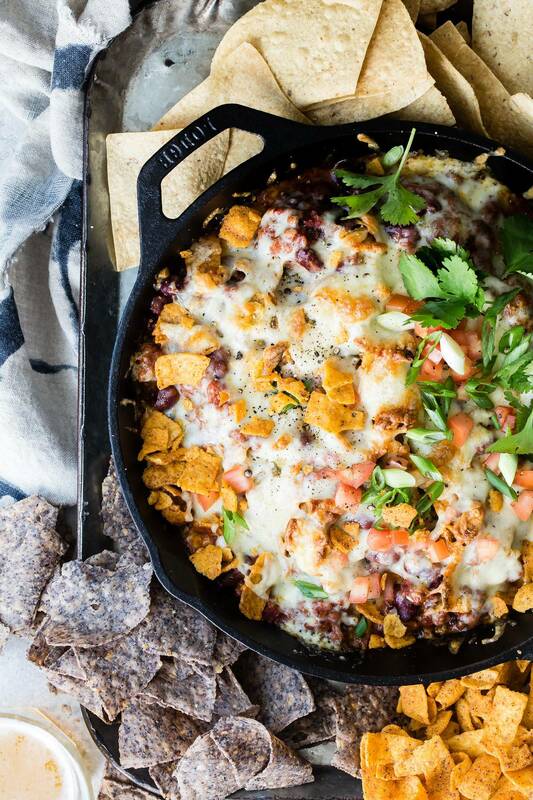 This is the perfect dip for any game day. Serve with plenty of chips! In a 10 inch cast iron pan or oven safe skillet add the beef and brown until no longer pink. Drain the grease from the meat and add the tomato paste, diced tomatoes, kidney beans, pepper, paprika, chili powder, cumin, and salt. Bring to a simmer and add some crushed Frito chips. Top with the grated Pepper Jack and Vermont Cheddar Cheese. Transfer the pan to the oven and bake for about 25 minutes and the cheese is hot and bubbling. Garnish with extra Frito chips, green onions, and cilantro. Serve at once with tortilla chips. great day to go all in and damn the calories, this is the kind of stuff I miss in my day to day diet purgatory so a fun splurge with stuff like fritos is a nice excuse whether or not I use the game day exscuse! Sabrina: I totally agree! We make Chile (my husband makes it with 1or 2 slices of crispy bacon added). And when we have leftovers, we make chili dip & serve with Fritos or Tostitos. Soo yummy! Are you aware that the title of this recipe for Fritos Chili Dip is posted as Easy Valentine Raspberry Baked Doughnuts? Thanks Robin, I fixed it!